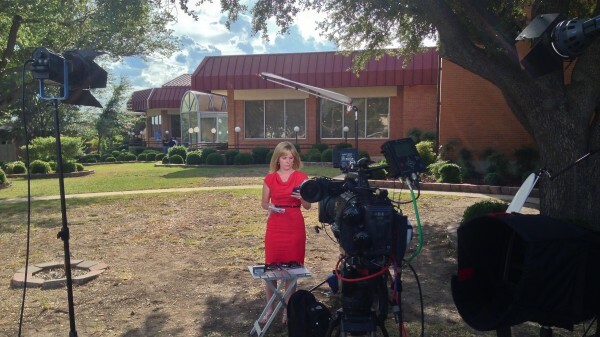 NBC News correspondent, Sarah Dallof gets ready for another live shot. With the trial approaching closing arguments, I headed down to Killeen, TX to do some more live shots for NBC News Channel. I was shooting on the HDX-900. For two days I was on the base with NBC News correspondent, Sarah Dallof. At this point my “live shot” set up is pretty set in stone. I know what works so that’s what I stick with. I use two 400w Kobold HMIs to light my correspondent. I mounted a scrim above Sarah to eliminate the harsh shadows that the sun can cast. The finally ingredient is just plenty of sand bags. Live shots are fun to do and most of the time it’s simple to get a great looking shot. I could have been in Killeen, TX for a couple of more days but I was already booked on another shoot. Time to head back to Dallas!